The Pittsburgh real estate market is about as healthy as it has been in quite some time. Real estate in Pittsburgh appears set to appreciate more than the national average in the coming year. Pittsburgh real estate investing was firing on all cylinders in the first quarter of this year, and should continue to do so for the foreseeable future. The Pittsburgh real estate market has strong fundamentals in place, and savvy real estate investors are starting to take notice. Not only did median home values in the Steel City increase at a clip nearly two times the national average in the last 12 months, but Zillow’s one-year forecast suggests real estate in Pittsburgh will continue to outpace the rest of the country. There’s no doubt about it: the Pittsburgh real estate market is about as healthy as it has been in quite some time. As a result, Pittsburgh has become the beneficiary of a rather strong investor movement. Pittsburgh home prices and values have become the beneficiary of a relatively hot market. Following a year in which prices increased by as much as 11.7% (July 2017 through August 2018), real estate in Pittsburgh now boasts a median home value of $142,800, according to Zillow. To put things into perspective, the median home value across the United States increased 6.5% over the same period, and now sits somewhere in the neighborhood of $216,700. Despite median home values coming in considerably lower than the national average, it’s promising to see the rate of appreciation in Pittsburgh, which nearly doubled the pace of the national average over the last 12 months. Perhaps even more promising, however, is Zillow’s latest forecast, which calls for real estate in Pittsburgh to once again outpace its national counterpart, albeit at a more tempered pace. Whereas national home values are expected to increase 6.4%, the Pittsburgh real estate market could see an appreciation rate upwards of 7.2%. Pittsburgh real estate investors should take solace in their decision to continue investing in the area. According to RealtyTrac, there may be as many as 1,660 foreclosures in and around the Pittsburgh real estate market. To be clear, that number accounts for houses in several stages of distress (default, auction or bank-owned). More importantly, each distressed property represents a unique opportunity for savvy Pittsburgh real estate investors. 41.4% of the distressed properties in the Pittsburgh real estate market are pre-foreclosures, which means the owners are late on payments, but have yet to actually fall into foreclosure. That said, investors looking to acquire a distressed property may want to try looking at the records held in their local courthouses, as pre-foreclosures are public record. 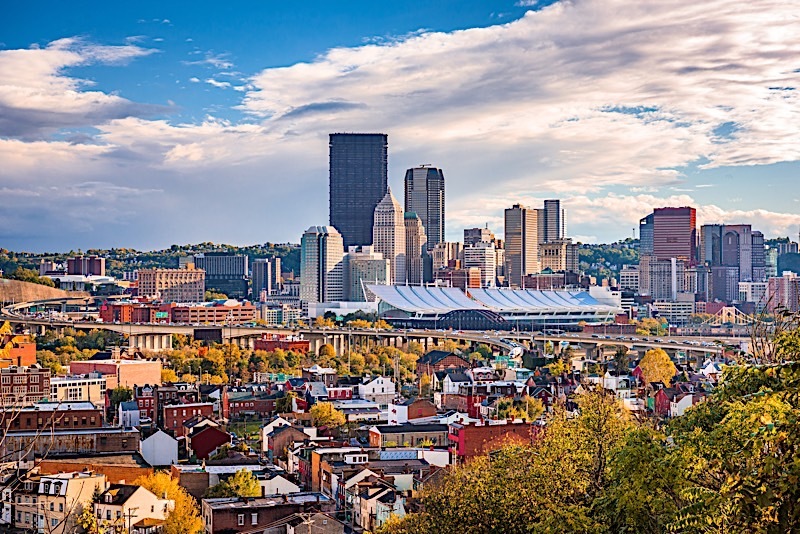 Pittsburgh real estate investing has become the subject of growing interest, and for good reason: few cities across the country have been more generous to real estate entrepreneurs. According to Attom Data Solutions, “Among the 136 metropolitan statistical areas analyzed in the report with at least 50 home flips completed in Q1 2018, those with the highest average gross flipping ROI were East Stroudsburg, Pennsylvania (164.1 percent); Pittsburgh, Pennsylvania (146.6 percent); Atlantic City, New Jersey (133.3 percent); Reading, Pennsylvania (120.8 percent); and Philadelphia, Pennsylvania (110.2 percent). The Pittsburgh real estate market has been a great place to execute flipping strategies. However, increasing prices are making it more difficult to find deals with attractive profit margins. As a result, Pittsburgh real estate investors may want to consider an alternative strategy: long-term buy and holds. Exercising a buy and hold strategy in the Pittsburgh real estate market awards investors the opportunity to offset today’s appreciation rates with equally impressive rental income. With a median rent price of $1,295, Pittsburgh real estate investors could justify higher acquisition costs in a few short years. Pittsburgh real estate investing is firing on all cylinders, and nothing seems to suggest that things won’t continue going well for the foreseeable future. Increases in median home values are expected to outpace the national average in the coming year, and demand remains intact. More importantly, the Pittsburgh real estate market is about as healthy as it has been in quite some time. Have you thought about investing in the Pittsburgh real estate market? If so, what are you waiting for? We would love to know your thoughts on real estate in Pittsburgh in the comments below.